Café Nécessté is very tiny cafe-restaurant at small town Ojiya. All of our menus are vegan acceptable vegetarian dishes. Our aim is to use local products more than 80%, use organic, pesticide-free, or less pesticide products more than 50%, of all our using material. Dinner available only for reservation. We will open until 15:00, 30th, December at the end of this year. In 2019, due to heavy snowfall, we will restart business on February 15th(Fri.). 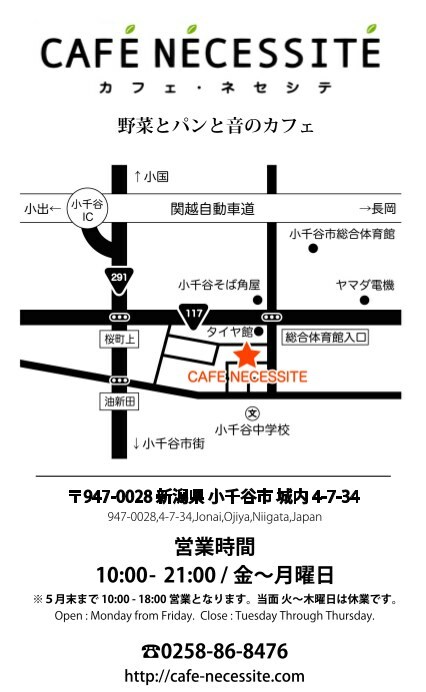 *Please make reservation by E-mail or Phone, because we only offer 10 to 15 meals a day. *Gluten-free menu or Buddhist vegetarian (Oriental vegetarian) menu available only by reservation more than one week before your visit.